Broken glass is a danger to rubber gloves, skin, ongoing tests and anyone in the lab. Safely collecting and storing non-biohazardous broken glass is critically important. What is our real solution to this real problem? 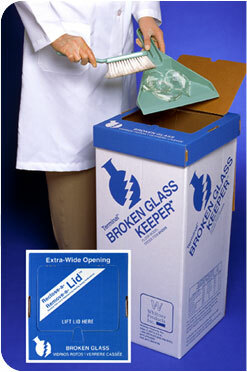 The Whitney Medical Solutions' Broken Glass Keeper - Floor Model. Decrease the risk of injury from non-biohazardous broken glass and other sharp objects by segregating them from non-sharp waste, safely collecting them in the Broken Glass Keeper. Easy-access collection containers make it convenient to safely dispose of non-biohazardous broken glass from your lab. Keep your lab technicians safe with our disposable lab waste containers. The Broken Glass Keeper - Floor Model features a sturdy corrugated container lined with a clear, thick plastic bag, and is prominently marked with broken glass symbols. The carton’s warnings are printed in both English and Spanish for added safety and convenience. A unique Reclose-A/Remove-A-Lid™ allows you to reclose the container during use to reduce odors and mess, or you can remove the lid entirely. A wide-mouth opening easily accommodates disposal of large items. Inner flap seals the lid when the container is filled. Containers ship and store flat, saving valuable storage space and easily fold together for use. Who Needs Our Disposable Broken Glass Containers? The Whitney Broken Glass Keeper also comes in a Bench-Top model for individuals who want to get rid of non-biohazardous glass right at their workstation. To learn more about our innovative disposable solutions for non-biohazardous broken glass, contact us or request a free sample.